The University of Miami (informally referred to as UM, U of M, or The U) is a private, nonsectarian research university located in Coral Gables, Florida, United States. 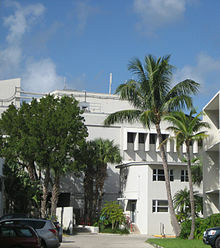 As of 2014, the university currently enrolls 16,774 students in 12 separate colleges/schools, including a medical school located in Miami's Civic Center neighborhood, a law school on the main campus, and a school focused on the study of oceanography and atmospheric sciences on Virginia Key, with a research facilities at the Richmond Facility in southern Miami-Dade County. These colleges offer approximately 115 undergraduate, 104 master's, and 63 doctoral of which 59 are research/scholarship and four professional areas of study. Over the years, the University's students have represented all 50 states and close to 150 foreign countries. With more than 14,000 full and part-time faculty and staff, UM is the sixth largest employer in Miami-Dade County. Research is a component of each academic division, with UM attracting $346.6 million per year in sponsored research grants. UM offers a large library system with over 3.1 million volumes and exceptional holdings in Cuban heritage and music. UM also offers a wide range of student activities, including fraternities and sororities, a student newspaper and radio station. UM's intercollegiate athletic teams, collectively known as the Miami Hurricanes, compete in Division I of the National Collegiate Athletic Association, and its football team has won five national championships since 1983. A group of citizens chartered the University of Miami (UM) in 1925 with the intent to offer "unique opportunities to develop inter-American studies, to further creative work in the arts and letters, and to conduct teaching and research programs in tropical studies." They believed that a local university would benefit their community. They were overly optimistic about future financial support for UM because the South Florida land boom was at its peak. During the Jim Crow era, there were three large state-funded universities in Florida for white males, white females, and black coeds (UF, FSU, and FAMU, respectively); in this accord, UM was founded as a white, coeducational institution. The University began in earnest in 1925 when George E. Merrick, the founder of Coral Gables, gave 160 acres (0.6 km2) and nearly $5 million, ($67.5 million, adjusted for current inflation) to the effort. These contributions were land contracts and mortgages on real estate that had been sold in the city. The University was chartered on April 18, 1925 by the Circuit Court for Dade County. By the fall of 1926, when the first class of 372 students enrolled at UM, the land boom had collapsed, and hopes for a speedy recovery were dashed by a major hurricane. For the next 15 years the University barely remained solvent. The construction of the first building on campus, now known as the Merrick Building, was left half built for over two decades due to economic difficulties. In the meantime, classes were held at the nearby Anastasia Hotel, with partitions separating classrooms, giving the University the early nickname of "Cardboard College." What are the academic rankings for University of Miami? 1. number 44 for Academics. What universities are similar to University of Miami?